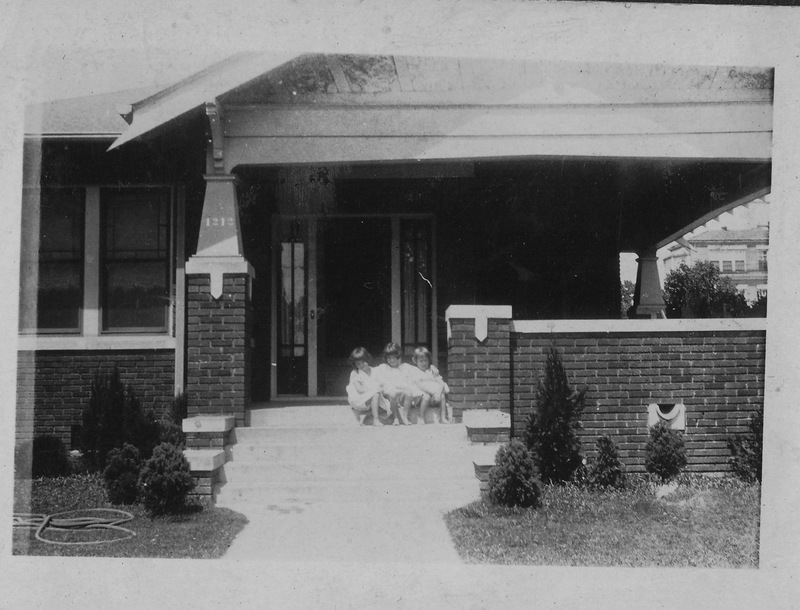 1212 Strong Avenue, with Mamie, Tiny and Sara on the bungalow steps. “In the spring of 1929 we began making preparations to move to Jackson. When school was out that year we said goodbye to our friends with mixed feelings of not wanting to leave and of excitement about moving to a larger town. I can remember sitting on our front steps, where we had played so often, remembering the good times we had had and wondering if things would ever be the same. No, Sara, things would never be the same. They never are, no matter how much you wish for them to be or how carefully you plan. In retrospect, you can spot where a life or a job or a family began to slip off the rails, but it’s always too late to make the adjustments that might have made a difference. 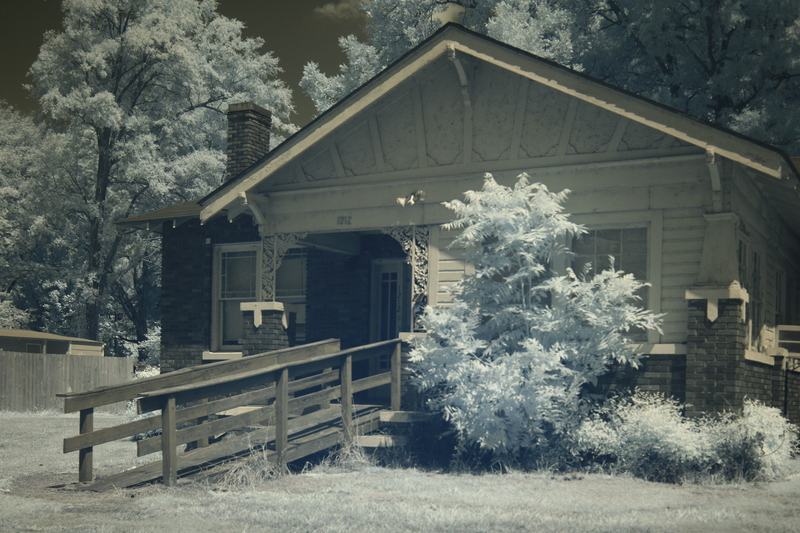 For the past twenty years, I’ve dealt with old houses and their abandonment and loss and nothing that I’ve researched or written about affects me like these photos of 1212 Strong Avenue. This was a home in every sense of that overused word, a safe haven and an anchor and the pride of Howard and Jessie and their four children. It must have been a wrenching decision to pack up and leave, lighting out for the unfamiliar streets and challenges of Big City Jackson, saying goodbye to the town which had become their own. When they returned three years later, they returned as a vastly different family, forever altered, and one that never made it back to Strong Avenue. Sara loved the bungalow, and it registers in my memory as one of the first Greenwood sites which I knew was special to her and to our family. Like so much of that part of town, it rocked along and was cared for and seemed peaceful until the last ten or twenty years, when time and poor choices and carelessness began to pull it down. The beloved porch, where dolls were lined up and hoses sprayed and jacks thrown and dreams dreamed, was enclosed for some purpose or another. The paint along the windows has begun to visibly crack and the yard has grown wilder and the whole house seems to be losing heart. Which I suppose is understandable when you’re ninety years old. Ninety years, for Pete’s sake. How did that happen? I’d love to slip in there, just for a few minutes, and see the breakfast room window where Sara spotted “the nake” and the hallway where Mrs. Pettey and Mable huddled with Bama and Jessie and the girls during storms, and the bedroom where Tiny borrowed her daddy’s handkerchiefs to make fake slings for fake broken arms. And the fireplace where the big sisters warmed Son’s potty chair: If that little singsong ditty doesn’t have Mamie’s devilish humor written all over it, I can’t imagine what does. Happy times, happy children, memories still echoing through the rooms of 1212 Strong Avenue. I just hope whoever lives there now loves it. That’s all you can hope for in any house.